And the answer was obvious, of course he bloody didn't! Still, we were going to celebrate it in the usual Gandermonium style regardless, much like Burgers 'stag do' earlier this year. The plan was to get the 0911hrs train from Carshalton up to town before getting the 1028hrs From Liverpool Street. All we needed was for the tube to be running and the weather to hold out for another entertaining afternoon. Looking at the weather reports the night before I could see that we were due to get a large amount of water hitting us for most of the day. With my alarm set for seven o'clock, I thought that would give me plenty of time to do the usual three S's. As my luck is at the moment this was not to be the case as instead of pressing the snooze button on my alarm, I instead turned it completely off. The next time I looked at the clock it read 0842. That meant I had exactly 29 minutes to catch a train. Having to use an emergency Brut shower, I managed to get out of the house just before the clock struck nine. With time against me I had to trot some of the way to make the station. This little run was pointless because when I got to the station I saw that the bleedin' train had been delayed! Taz was soon on the platform with Bacon rolls and we awaited as the train delay got longer and longer. Eventually we managed to clock it in the distance. Still somehow it managed to take an age to roll into the platform. With 4 Days on the early bus back from Taff Land everyone else was already on board (Mr X, Wardy, Sean & Indy). As it was Junita's birthday, I did have a present for him in the guise of not one but two packets of Brannigan's crisps! Yeah I know, how generous am I? Still, without the birthday boy on the booze cruise I gave the crisps to Mr X instead. As there were several disruptions to British Rail the train that we were on became quite overcrowded. One fella even managed to sit on one pack of the crisps, much to the mystery man's horror. Finally getting to Farringdon, we popped onto the tube and headed towards Liverpool Street. We did finally manage to arrive just a minute after a fast train had left. After some discussion we decided that instead of the 1028hrs train, the 1040hrs was quicker and more direct. So half an hour to kill, what do we do? Pub anyone? The Hammy Hall was the first licensed premises of the day and after a quick drink we were on the 1040hrs Standard Express (a joke from the last trip) to Stortford. We managed to arrive just after eleven, and with the rain threatening to proper piss it down, we rushed double time towards the local 'Spoons. The now usual old man talk of surnames followed along with the fixtures of FA Trophy. Niiice doggy! Yes you are, yes you are! We also received the sad news that Warren Mitchell AKA Alf Garnett had sadly kicked the bucket with a grand old innings of 89 on the board. For me, "Till Death Us Do Part" and its follow up, "In Sickness and in Health" were some of the old comedy classics that still to this day never fail to make me laugh. As the old saying went "It stands to reason..."
A couple of pints later, and Wardy tried to introduce some sort of lime flavoured vodka chocolates that he'd wandered off & purchased from a local 99p store opposite the boozer. Luckily I managed to swerve these and not before long we were on our way to another pub. Like last time, we ended up in the Black Lion and took up residence around the juke box. As always, the usual hits of Plastic Bertrand and Ylvis echoing around the gaff were not far behind. The next pub on the list was "The Star" and an amazing looking Husky dog. There was just enough time before our sherbet arrived to take us to the ground. £13 later and we were in the small bar having a final drink before taking our place at one end of the ground. With several injuries to bargin with, and the rain making it a wet surface, today could go either way. Worner, Downer, Wishart, Beckwith, Cooper, Collins, Bolarinwa, McAllister, Dundas, Eastmond, Fleetwood. Bench Warmers: Gomis, Stearn, Wright, John, Shaw. With the wind swirling around in places, Sutton seemed to start the stronger of the two teams. The two wingers managing to get the better of the full backs several times. With McAllister & Dundo up front. it seemed to be the better of the recent attacking line ups as the wet pitch and wind suited the more physical players. With nearly twenty minutes gone, Sutton got the breakthrough. Dundas played the ball out to Fleetwood. Using his pace and power he managed to take around the defender and drag it into the box. He then curled the ball over Lovelock in goal. It seemed to be going into the top corner, but hit the bar and then the post. As the ball came back into the box, for once it fell to a Sutton player and Dundo scooped the ball into the back of the net. 1-0! After taking the lead Sutton kept up the pressure. Several times Sutton could've doubled their lead. I think Dundo had the best chance but his off the cuff volley was blindly blocked by the back of a retreating defender. With a couple of minutes to go to the end of the half, it was my turn to buy the halftime round. Breathalysers at football. Whatever next? The second half saw Sutton maintain the pressure without get the desired results. Stearn was brought on for an injured Bolarinwa. If I was to be honest, I felt that this wasn't to be the best forty five minutes from Stearn. Several times his final decisions let him down and for most of the half it looked like the match was going to end 1-0. Eastmond took a booking with a Downer like challenge in the middle of the park. Stortford done their best to close the gap in the disciplinary tables with several bookings of their own to boot. Most of the second half saw Sutton just fail with the final ball. Sometimes we'd shoot instead of pass and our shooting at times seemed wild and untamed. With five minutes remaining Fleetwood was replaced with Wright. I thought Fleets had played well as a left winger, but if he is going to score he might need to play upfront a bit more. With a couple of minutes left, Sutton finally got the killer goal. Wright managed to get onto a through ball from McAllister and strive into the box. Instead of shooting he played the ball across the penalty box and left Stearn with a reverse slot into the back of the net. 2-0! After this Sutton saw out the game and tucked the 3 points in the old back pocket to take home with them. After the game we all shuffled back into the bar to check the other results. Apparently we were now sixth in the league only a point outside the play offs. But that only makes the dropped points against Yeading & Oxford harder to stomach. It wasn't long before we ordered a sherbet to take us back to town, but this was not before a little chin wag with Collins & Stearn. Back at a deserted Black Lion we stormed the Juke box once again with 1990s Electronica. From out of nowhere Wardy appeared with Jam Doughnuts, doesn't he realise that Custard Doughnuts are the true way forward? Watching the Swedenmark match on tv paved the way for a decision on what train to get back to town. As always beer and food was purchased for the journey. As the trip would only take 45 minutes we didn't need that much. Of course Mr X & Taz forgot this fact as they both brought large amounts for the way home. Taz had ventured to a chippy and brought five large portions of chips. The only part that he fell down on was that they were unseasoned. Yeap that's right no salt, no vinegar, no pepper. Just a couple of stone of deep fried potato. At least Mr X went the other way and brought £20 worth of deep fried Chicken loveliness. At some point in the journey Taz tried to squirt some water on me but my quick cat like reactions had me jumping onto the floor. Not quite sure why I done that but it scared the hell out of some bird next to us! We managed to get through the tube and back to Farringdon without any further incident except one and with every one still accounted for. 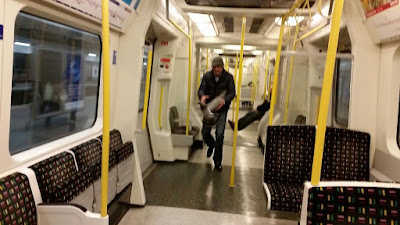 That one incident was when jumping on the tube, we were followed by a certain pigeon. Of course, being the bird mad that we are. We attempted to save it some distress by catching it. As most of you are aware, our bird catching abilities are somewhere in-between abysmal and non existent. Still that didn't stop one member of the Firm doing his best as the rest of the gang sang the theme tune to 'Stop the Pigeon'. I know this may come as a shock to you but some people actually don't like the idea of half a dozen drunken idiots sitting next to or near them. This is also possibly because they were showing an unlikely interest in the classic 1981 children's animation "Pigeon Street". One member of the Firm did show an unhealthy 'interest' in Clara the long distance lorry driver! Back in Sutton and there was only one place to lay our hats and O'Neills came calling. Surprisingly they actually let us in and for the next four hours we had a drink for the road. Eventually one by one people begun to filter home before, as per usual, me & Taz were the last two left. Once again there was no queue for the Sherbet and the cabbie remembered us from a previous journey, still not sure how he compared a night out in Kingston to the current problems with IS, surely he meant Croydon? "Yeah, that one. He looks a right nonce in that one...."